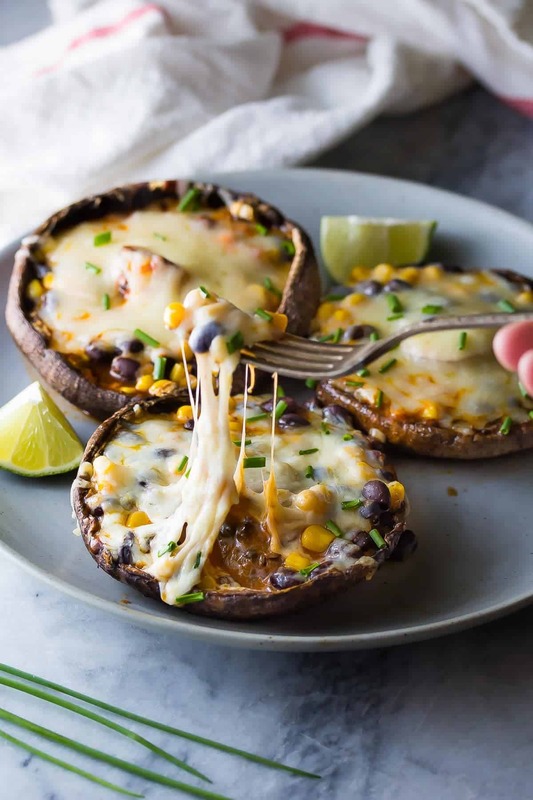 These enchilada stuffed grilled portobello mushrooms are an easy vegetarian dinner recipe that is ready in under 25 minutes, and won’t leave you feeling hungry. It’s that time of year again: I want to throw everything and anything on the grill. How about you? Pros to using the grill: less dishes. You can work on your tan while it cooks. Less dishes. You get to wear flip flops. Did I mention? Less dishes. So maybe I’m motivated by a singular, but very persuasive reason. 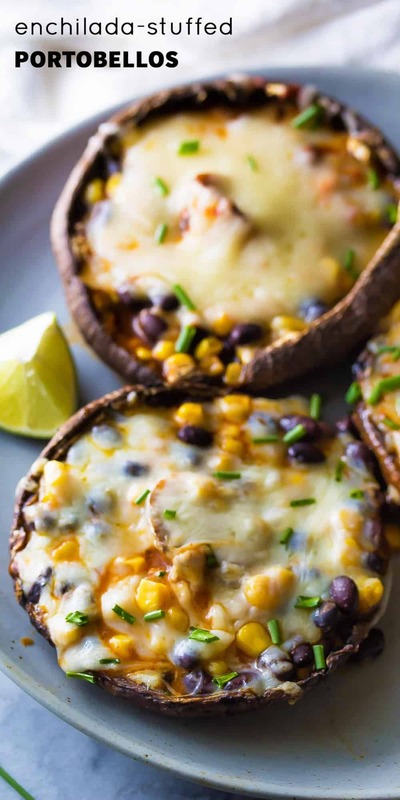 And these enchilada stuffed portobello mushrooms barely make any dishes…just one bowl. You’re welcome! I am so happy because Ben (aka Mr. Carnivore) has not been putting up a fight when it comes to vegetarian recipes lately. Probably because I always always ALWAYS make sure there is plenty of protein to keep us full. There is nothing worse than feeling hungry an hour after dinner, right? These grilled portobello mushrooms are no exception. They are filled with corn and beans, enchilada sauce, and topped with cheese. So lots of protein! We enjoyed ours with a side salad, but on their own, the mushrooms are quite filling! I got the idea to make these mushrooms when I was looking back at this Grilled Mushroom Appetizer with Bruschetta and Goat Cheese. It got me thinking about all the delicious things you can stuff in a mushroom cap. And enchilada flavors sounded pretty darn perfect. My first batch of these ended up really watery…the mushrooms release liquid as they cook and it turned the enchilada sauce into a soupy liquidy mess. So for round 2 I mixed the enchilada sauce with a tablespoon of flour and that did the trick. Much less soupy! These guys only need to cook on the barbecue for 5-6 minutes! The cheese gets melty, the sauce is bubbly and the mushrooms are *just* cooked through. You don’t want them to overcook because they collapse into a pile of mush and the enchilada sauce will escape. In total, this recipe is ready in 21 minutes! Does that sound like the perfect Thursday dinner recipe or what? I’ll see you guys on Saturday with a big old collection of summery one-skillet dinner recipes. Are you excited? I am!! 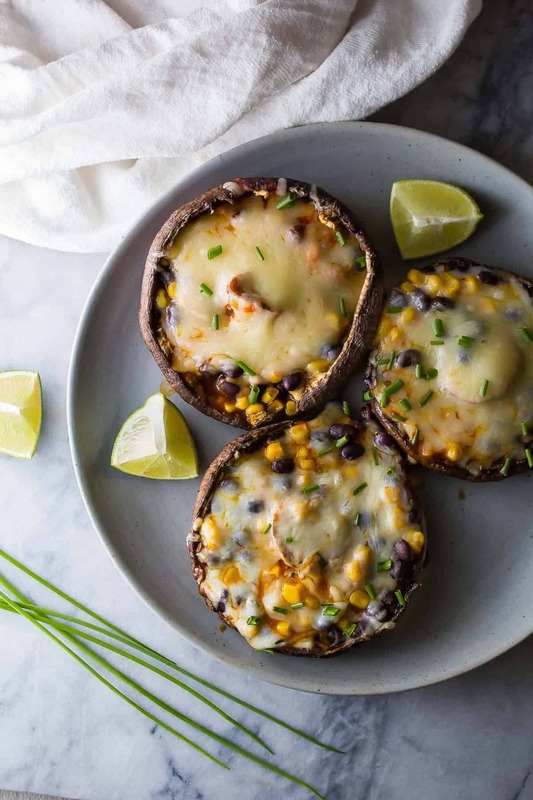 These enchilada stuffed grilled portobello mushrooms are an easy vegetarian dinner recipe that is ready in under 25 minutes, and won't leave you feeling hungry. Pre-heat your barbecue to medium-high heat. Using a small spoon, scoop the gills out of the mushrooms. Brush mushroom exteriors with olive oil and place on a large plate. In a medium bowl, whisk together the enchilada sauce, salt and flour until no lumps remain. 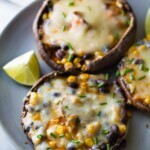 Spoon around 2 tablespoons of corn and black beans into each mushroom. Drizzle with the sauce. Top with shredded cheese. To grill:Grill over direct heat (on a veggie grilling plate, or directly on clean grill) for 5-6 minutes, until cheese is melted and sauce is bubbling. Sprinkle with chives and serve with a side salad. To bake:Heat oven to 450°F. Bake for 5-10 minutes, until cheese is bubbly and mushrooms are softened (but not mushy). 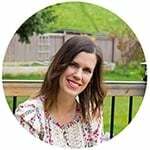 Canadians: I was able to find Casa Fiesta enchilada sauce in my neighborhood Co-op grocery store, but if you are unable to find it, I've used this recipe to make it from scratch in the past. Great recipe. I modified it a bit by grating some pepper jack cheese into the mixture to help bind it together and then some more of the cheese on top. I finished it off with a slice of pickled jalapeno for some spice. My entire family loves these, even my child that doesn’t like mushrooms. I’ve now made them several times and only bake for about ten minutes and they’re amazing. We don’t like our mushrooms mushy or canned mushrooms, so the texture of these are perfect for us. I needed more protein, so I added some browned ground beef. I made some quick homemade enchilada sauce. I baked them (without pre-baking the mushrooms. They turned out great and my husband loved them! Maybe your mushrooms were larger than mine? Mine were tender but still with a bit of texture to them (and not mushy). Can you make these and freeze them? Tried this tonight but I added some loose apple sausage to the mixture before stuffing the shrooms, it was AWSOME! Thanks for the inspiration, this was my first time grilling a shroom and it was great. I’m so glad you liked them, Steve! Love the idea to add sausage, bet that gives them so much flavor! I have been trying to slowly and sneakily incorporate at least one meatless meal during the week just to cut down a smidge on the grocery bill. These look perfect! I think my family will love these. We are a HUGE fan of enchilada flavors. I just made this and WOW I love it! The only problem I had was that the mushrooms I got were soggy already. They kinda fell apart as I was cleaning the inside out. Other than that they were great! I will definitely make these again. Just watch where I buy the mushrooms for now one! I just attempted this recipe and am severely disappointed. I don’t have a grill, so I baked it as instructed. The recipe says bake at 400 for 5-10 minutes once mushrooms are filled up. I’ve never baked portobello mushrooms before so I was a little hesitant on not baking them first, before adding the filling. I pulled them out of the oven and they were NO where near done. I am reading the comments now and noticed on a reply to someone you put ” I’ve never baked my portobellos before, and I’m not 100% sure how it would work with this recipe, but this recipe bakes at 400 for 25 minutes. You might want to pre-bake the mushrooms for 10 min, then spoon in the fillings/cheese, and bake for the last 15 min”.. but no where is this mentioned in the recipe??? I am hungry (hangry) and annoyed that I wasted all the food. Hi Jade, so sorry you didn’t like the recipe. I can assure you I have tested this recipe in the oven since the reply to that comment was made, and it worked great as written on the recipe card (without pre-baking). If you were expecting really soft mushrooms, then I guess you would be disappointed by this recipe, the mushrooms MUST hold their form in order to hold the enchilada sauce/fillings. When I baked longer than 10 minutes, the mushrooms lost their shape and had a mushy texture I didn’t care for. Hi Patsy, sorry for the delay (holidays!) I haven’t tried this myself, but have seen a few recipes that bake at 400°F for 25 minutes. Let me know how they turn out for you! I am one of about 2% of the population that combining mushrooms with tomato sauce of any kind ends up with my mouth tasting a handful of pennies. Yuck! But anything else is ok. Have you ever tried this with an enchilada Verde sauce before? Hi Shalva, sorry for the late reply, we’ve been on holidays! I haven’t tried enchilada verde sauce, but if you do try it, I’d love to hear how it tastes! this looks so good Denise! love the pictures! Denise, I can’t wait to try these! I love different ways to enjoy mushrooms and these sound perfect! Can’t wait to share with my daughter as well! Looks so delicious! I don’t have a grill, so could I bake these instead? Thanks, Kalecia! I’ve never baked my portobellos before, and I’m not 100% sure how it would work with this recipe, but this recipe bakes at 400 for 25 minutes. You might want to pre-bake the mushrooms for 10 min, then spoon in the fillings/cheese, and bake for the last 15 min? Let me know how they turn out! Yo los hornee y quedaron DELICIOSOS ?? Omgosh, gorgeous! I’ve had a portobello recipe for years very similar to this method, but with different ingredients. Doing it for the blog this summer. Can’t wait to try yours too! I had to hop over from twitter to grab your recipe! Can’t wait to try these thanks. Pinned & shared. Have a fun weekend ahead. Sorry I’m so late on saying a big thank-you for sharing the recipe 🙂 Hope you had a great week-end, too. I could eat about 10 of these Denise, and grilling is my middle name right now! lol Can’t wait to try these!